Bringing pets, owners back together after Harvey - Houston Pets Alive! HOUSTON – Andrea Birkelbach is an animal lover through and through. It’s the reason why she founded Houston Pets Alive! two years ago. It’s a group dedicated to turning Houston into a no-kill city. “Every day Harris County animal shelter sends us a list of who they’re euthanizing and so we pull from that euthanasia list and place everyone into a foster home and that’s really our core,” Birkelbach said. However, for the past two weeks this group has had a different mission. “Our shelter system can’t handle all of the stray animals so what we’re set up to do is to take the owner-surrendered animals, the people that were affected by the storm that for whatever reason can’t keep their pets. We’ll take them and we also want to alleviate some of the pressure from the shelters,” Birkelbach said. You read that right, most of the pets they’ve taken in, including their current roughly 150 cats and 200 dogs, had owners. Harvey forced them to make an impossible choice: Hang on to their furry loved ones and struggle or give them up to ensure they are properly cared for. “What these owners must feel is heart-wrenching because for me your pet is your family,” Birkelbach said. Birkelbach expects more families will have to make the same difficult decision. There is a silver lining for Pets Alive! “This is the first time ever that the city of Houston is no-kill and we’ve been operating at a no-kill status for a week now,” Birkelbach said. Though these pets are not up for adoption locally, there is something you can do to help out. 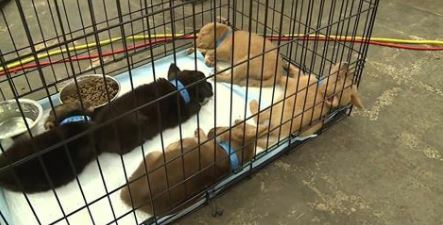 They need volunteers, especially during weekday business hours, to help care for all of the pets. They could also use cleaning supplies and monetary donations to buy the other supplies they need. Additionally they are looking for short-term foster homes for some of their animals who aren’t doing well in a shelter environment. To view the interview, click the link below.